1 Hiring and Compensation What Litigation Support and Other Legal Professionals Need to Know ACEDS Webinar August 6, 2014 Sponsored by: 2014 Robert Half Legal. An Equal Opportunity Employer M/F/D/V. 6 National Hiring Outlook: July December 2014 Lawyers were asked: What are your hiring plans for the second half of 2014? Plan to hire 29% Maintain current staff levels 52% Will not fill vacant positions 10% Anticipate staff reductions 2% 6 Source: Robert Half Legal survey of 200 lawyers among the largest law firms and corporations in the United States. 7 Legal Job Market Is Changing 56% 32% More than half of lawyers said it s challenging to find skilled legal professionals Nearly one-third are concerned about losing top performers 7 Source: Robert Half Legal survey of 200 lawyers with the largest law firms and corporations in the United States. 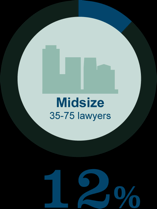 8 Small-to-Midsize Firms Hold Most Appeal Lawyers were asked, Ideally, what size law firm would you like to work for? 8 Source: Robert Half Legal survey of 175 lawyers among the largest law firms in the United States and Canada 2014 Robert Half. An Equal Opportunity Employer M/F/D/V. All rights reserved. This material is the confidential property of Robert Half. Copying or reproducing this material is strictly prohibited. 10 Where the Legal Jobs Are Lawyers were asked, Which one of the following practice areas will offer the greatest number of job opportunities in the second half of 2014? Litigation General business/commercial law Intellectual property Labor and employment Energy/oil and gas Real estate Family law Privacy, data security and information law 6% 4% 4% 3% 3% 2% 20% 42% Regulatory/compliance 2% 10 Source: Robert Half Legal survey of 200 lawyers with the largest law firms and companies in the U.S.
11 Litigation to Drive Legal Hiring Lawyers who cited litigation as a response also were asked, Which of the following areas of litigation, if any, will offer the greatest job opportunities in the second half of 2014? Insurance defense Commercial litigation 31% 30% Personal injury Employment Class actions Intellectual property Other 4% 3% 15% 16% 20% 11 Source: Robert Half Legal survey of 200 lawyers with the largest law firms and companies in the U.S.
17 Gauging a Job Seeker s Success Lawyers were asked: What s the best indicator of a job applicant s potential for success in your organization? Previous work experience or prestige of former law firm/company 49% Referral from a current employee or member of network 21% Educational background Work ethic Personality/ability to fit in with others/corporate culture 4% 3% 11% 17 Source: Robert Half Legal survey of 200 lawyers with the largest law firms and companies in the U.S.
21 Questions? 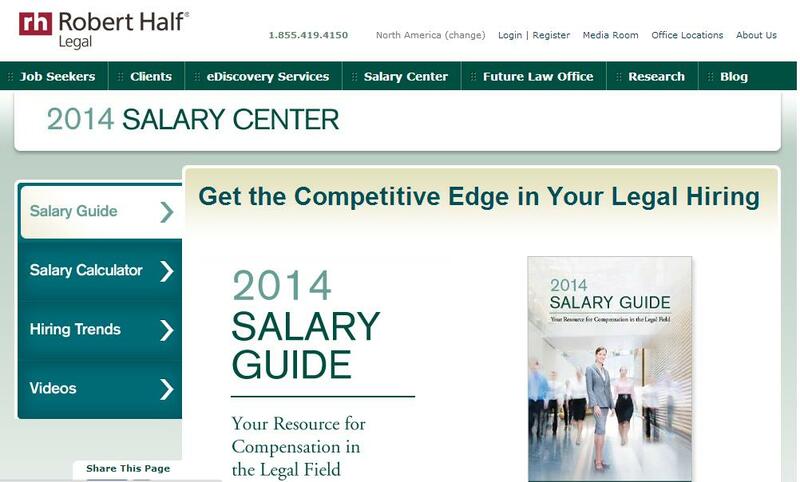 For more information, visit Robert Half Legal s Salary Center Download latest Robert Half Legal Salary Guide Access Salary Calculator Learn about hiring trends and positions in demand Robert Half Legal. An Equal Opportunity Employer M/F/D/V.